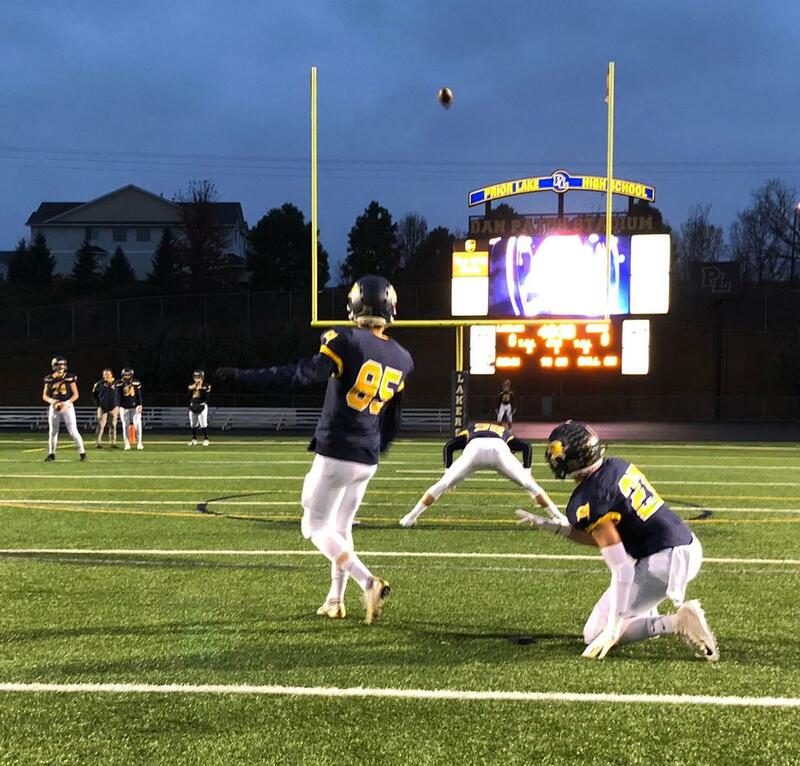 Quarterback Colin O’Connor threw two touchdowns and rushed for two more as the Prior Lake Lakers defeated the Buffalo Bison 52-42 Oct. 26 at Dan Patch Stadium in one of the highest scoring games in recent memory. Fifty-two points is the most Prior Lake has scored in a game since dropping 60 on Farmington in 2014. The Bison struck first in what turned out to be a back-and-forth affair. Despite being backed up on their own 6-yard line, Buffalo took a shot on the first play as quarterback Aidan Bouman connected with receiver Treyton Welch deep down the Laker sideline for a gain of 43 yards. It looked as though the Prior Lake defense had gotten a stop on a fourth-and-13 at the 21-yard line but a late flag for pass interference extended the drive. Two plays later, Bouman connected Welch in the end zone to give the Bison a 7-0 lead less than three minutes into the game. Prior Lake’s offense answered quickly, a phase that could be said at many points throughout the contest. A number of runs advanced the ball just past midfield before O’Connor connected with receiver Parker Ellis for a 20-yard gain along the Laker sideline. A couple plays later, O’Connor faked a handoff to running back Keaton Schroeder and fired a strike to Ellis, who was wide open at the goal line for a touchdown. Kicker Mike Nelson added the extra point to tie the game 7-7 with 5:50 to go in the first quarter. The Laker defense almost held on the following drive. With the Bison facing a third-and-8 at the 26-yard line, Bouman threw a pass over the middle, intended for Welch but the throw was too high and tipped off his hands. Unfortunately for the Lakers, the slight deflection tipped the ball right to another Buffalo receiver, who caught it for a first down. Despite their misfortune on the pass play, Prior Lake got a break later in the drive with Buffalo setup with a third-and-goal from the Laker 1-yard line. Running back Riley Habisch could not control the direct snap and safety Austin Gordon jumped on the loose ball to give the Lakers possession and end the threat. Unfortunately, Prior Lake was forced to punt for the only time in the game on the ensuing possession. Buffalo retook the lead on the first play of the second quarter. Bouman found Welch in the middle of the field, who made a Laker defender miss and then took off down the Bison sideline, all the way into the end zone, 14-7 Buffalo. It looked as though Prior Lake was going to march down and score once again on the next drive thanks to a pair of long runs by Schroeder but the drive stalled once the Lakers reached the 10-yard line, concluding with an O’Connor incomplete pass intended for Ellis on a fourth down. Buffalo took a risk on the next drive, choosing to go for it on fourth-and-2 on their own 13-yard line. The risk paid off as they converted and they later capped off the drive on a 13-yard touchdown pass from Bouman to receiver Tony Dahl, giving the Bison their largest lead of the game at 21-7 with 5:36 to go in the first half. Prior Lake didn’t panic and responded by going back to the ground game. The Lakers put together a 10-play 65-yard drive of entirely run plays, finished with a 6-yard touchdown run by running back/linebacker Spencer Shaver to cut the Bison lead to 21-14 with 1:00 to go until the half. The Laker defense came up with the biggest stop of the night on the ensuing possession. The Bison converted one first down before the Lakers forced a pair of incompletions and a holding penalty on third down. Buffalo ultimately had to punt, something they had only done seven times all season. The snap went over the punter’s head. He went back and fielded it in his own end zone and instead of punting it, tried to throw it down field. The pass fell incomplete, allowing the Laker offense to take over at Buffalo’s 19-yard line with under 20 seconds to play until halftime. On the ensuing play, O’Connor took the snap and threw to the middle of the end zone, connecting with Ellis between a pair of Bison defenders for a touchdown to tie the game 21-21 with just nine seconds to go until halftime. The Lakers received the second half kickoff and capitalized. Prior Lake once again used the ground game to march down the field, highlighted by a 55 yard run from Shaver, who ran down the Buffalo sideline and dove for the end zone but was ruled just short by the official. O’Connor ran the ball into the end zone on the following play to give the Lakers a 27-21 lead. There was a bad snap on the extra point, Nelson picked up the ball and tried to run it into the end zone for the two-point conversion but was stopped short by a Bison defender, according to the officials. Buffalo seemed to take the momentum back on the next drive when, facing a fourth-and-7 on the Laker 29-yard line, Bouman connected with receiver Jack Munsterteiger for a touchdown to retake the lead 28-27 with 7:26 to go in the third quarter. The Lakers quickly answered back however with one of the bigger plays of the game. Facing a third-and-4 from their own 26-yard line, O’Connor dropped back and threw a screen pass to Shaver, who caught the ball, followed his blockers and sprinted down the Lakers sideline. Shaver was tripped up at around the 10-yard line but backpedaled as he tried to stay on his feet and dove for the end zone. He was ruled down at the 1-yard line and again O’Connor ran the ball in on the next play to give the Lakers a 33-28 lead with 5:17 to go in the third quarter. O’Connor’s pass on the two-point conversion attempt fell incomplete. Prior Lake’s defense made a big stop on the ensuing possession, forcing a three-and-out and getting the offense the ball back near midfield. The Lakers then marched down the field and extended their lead on a jet sweep by Ellis, who ran the ball in for an 11-yard touchdown. They then ran a similar play on the next snap, with Ellis running it in for a two-point conversion to push the Laker lead to 41-28 with 1:23 to go in the third quarter. The two possession lead was key for the Lakers but the Bison weren’t done yet as Bouman found Munsterteiger for a 26-yard touchdown on the next possession, cutting the Laker lead to 41-35 with 10:52 to go. But again the Lakers went back to the rushing attack with a 10-play 55-yard drive of entirely run plays, capped by a 15-yard touchdown run by linebacker/running back Sam Emmerich, who had not played much on offense since earlier in the season. The two-point conversion run by Ellis was good and the Lakers again extended their lead, this time to 49-35 with 5:05 to go. The Bison were down but not out yet. A couple plays into the ensuing drive, Bouman connected with Welch on a screen pass, who weaved his way all the way across the field before sprinting down the Bison sideline for a 70-yard touchdown, making the score 49-42 Lakers with 4:39 to go. After an unsuccessful onside kick by Buffalo, the Lakers went back to the ground game, chewing a couple minutes of the clock and forcing Buffalo to use their timeouts. However, Buffalo stopped the Lakers when they got inside the 10-yard line and coach Matt Gegenheimer had a decision to make, facing fourth-and-goal on the 2-yard line. Gegenheimer opted to try the field goal, something the Lakers have seldom done this season, but kicker Mike Nelson connected on the 19-yard attempt to increase the lead to 52-42 with 1:42 to go. Buffalo gave one last hurrah, marching down inside the Laker 10-yard line in the final minute but Bouman’s pass intended for Welch in the end zone was too high and fell incomplete, securing the Prior Lake victory. O’Connor completed 5 of 10 passes for 150 yards and two touchdowns while also rushing for 65 yards on 18 carries and two touchdowns. Shaver finished as the leading rusher with 11 carries for 119 yards and a touchdown while Emmerich had a breakout game with 15 carries for 109 yards and a touchdown. Ellis had four catches for 77 yards and two receiving touchdowns as well as a rushing touchdown. Shaver was also the leading tackler on defense with six while linebacker Noah Benson had five and a plethora of Lakers had four. The Lakers will face a familiar foe in the second round as they travel to Blaine to take on the top-seeded Bengals Nov. 2 with a state tournament berth on the line. Though they do not play each other during the regular season, the Lakers (5-4) and the Bengals (9-0) have faced off in the second round each of the last two seasons, a 21-17 Bengal win at Blaine High School in 2016 and a 49-7 Laker victory at Dan Patch Stadium in 2017. The Bengals haven’t lost since the Lakers ended their season last year as they enter this year’s game undefeated under first-year head coach Ben Geisler. Geisler was the longtime head coach at Irondale and spent the last three seasons as an assistant at Spring Lake Park. This year’s Blaine team is led by quarterback Jack Haring. Haring completed 127 of 187 passes during the regular season for 1,766 yards and 15 touchdowns while only throwing two interceptions. Haring’s top targets through the air are wide receivers Brandon Wittig and Jason Kaul. Witting led the team with 35 catches for 491 yards and four touchdowns in the regular season while Kaul was second with 22 catches for 361 yards and four touchdowns. Running back Will Frederickson led the ground game with 153 carries for 644 yards and six touchdowns. Haring is not afraid to run either as he was the second leading rusher during the regular season with 102 carries for 282 yards and six touchdowns. The winner between the Lakers and the Bengals qualifies for the state tournament will take on the winner of second-seeded East Ridge and third-seeded Eastview on Thursday Nov. 8 at White Bear Lake High School in the state quarterfinals. Kickoff against Blaine on Friday is scheduled for 7 p.m. at Blaine High School. According to PLHS Activities Director Russ Reetz, there will be no video stream for Friday’s game as of now due to region broadcasting rules. Be sure to check back next week for a recap of the Blaine game and, if the Lakers advance, a preview of the state quarterfinal matchup.